Everything you need for your strength and power workouts in only 1 m2 . Comprising of two pull-up bars of varying thickness, one 30 mm and one 50 mm, this rack that can be used by two people at the same time (another set of 50-mm J-Cups and a set of fasteners are needed for this) and you can use it to train your squat without help and without risk of accident. What more could you need? Once anchored to the ground, you will feel its stability and robustness instantly. It is made from structural steel and has a stove-lacquered powder paint coating finish that makes it extremely resistant to blows, standard humidity found in training areas and intense training. The double pull-up bar facilitates gymnastic exercises with a standard 30 mm thickness, while its 50 mm thickness allows you to work yourgrip at the same time. You can install it both at home and in the box. You can also add the full range of rack accessories, , so you can turn your power rack into a miniature box. 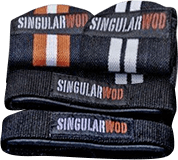 The Singular WOD Power Rack includes a pair of 50-mm J-Cups for the weightlifting bar, a pair of fasteners so you can train safely and minimise the risk of an accident, and a double pull-up bar with 30- and 50-mm diameter grips.